018.Mark Cypher – JavaMuseum 2010 – Celebrate! Mark Cypher received a Master of Visual Arts in Sculpture , in 1995, from Sydney University, Australia, and is currently a Senior Lecturer and Program Chair for Interactive Digital Design and Games Art and Designat Murdoch University – Western Australia. The practice and making of artificial life is a metaphor for neo Darwinist ideas about nature and the evolution of organisms. There are numerous convincing arguments for and against Darwin ’s theories. Indeed the ideas hidden within Darwin ’s narratives depend as much upon who is telling the story, when it is being told and by whom, without forgetting the organic species themselves. In fact one could easily discuss the evolution of the ‘story’ of the evolution of a species. 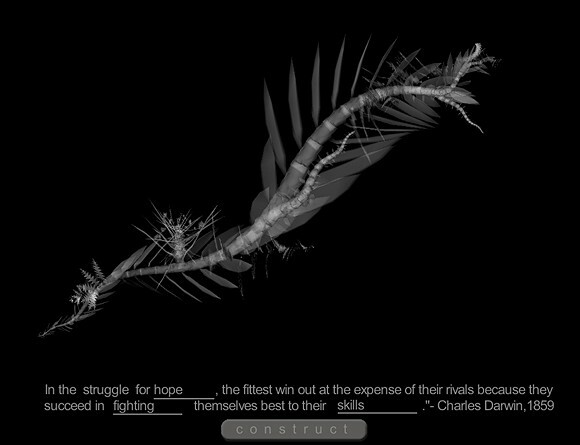 Similarly the artwork, “Gardenus” allows the user to change one of Darwin’s evolutionary tales and as such participate in the endless reproductive possibility of the signification of an organism.